A strange incident about a Buddha image that punishes , a sharing by the late Ven. LP Jarun Wat Amphawan. I will summarize the important talk as it has much details. A laity had once asked Ven. LP Jarun, does Tahn LP belief that Buddha image (bucha) will punish people? Tahn LP said whether its antique or beauty or for reverence, why would a Buddha image punishes. There will be no such but there is always a cause and effect. Ven. LP Jarun isn’t a monk that simply believes in supersitious. And today Tahn will share with you such an incident Tahn met before Tahn was even the Abbot of Wat Amphawan. Tahn LP was still in Wat Phromburi. It was year 2494 and Tahn just emerged from deep meditation. Khun Jae Pao, a long time faithful and loyal follower of Tahn LP for decades brought a Buddha image of Sukhothai era about 700 over years of age for Tahn to consult. Khun Jae Pao and husband seldom quarrels and have been a loving couple since dating days till now all three children are doctors. Khun Jae Pao was a food peddlar in school canteen frying bananas for a living while her husband a goldsmith craftsman. They have a comfortable standard of living. But they are both not the pious type which will chant or meditate at all. Khun Jae Pao requested Tahn LP to look into the strange happenings because she said ever since they acquired this Buddha antique image, everyday at 5pm they will feel angry with each other and start quarelling. When they look at the Buddha image, they are fuelled with anger. Tahn LP Jarun replied that it’s funny because never heard of such and it has a specific time to it as well. Tahn LP was asking many other questions to ascertain if it was dues to other reasons but was to no avail. Tahn LP requested to have a closer look at the Buddha image. Tahn LP said it was indeed a beautiful Buddha image, old, very good energies and has a beautiful smiling face too. Tahn LP said it was a real antique Buddha image made from samrit metals and when Tahn used his wicha to penetrate into the image, it was very responsive. Than LP told Jae Pao that he don’t believe that it was due to the Buddha image as it has good qualities but neither does Tahn himself knew what was the issue. Tahn LP asked Jae Pao if he can borrow it for reverence for 10 days. Tahn LP Jarun revered the bucha daily at Tahn’s personal altar, chanting and dedicating metta and merits to the bucha too. Tahn will always mention to the thevadas of this bucha to help solve Jae Pao’s mystery. 10 day passed but yet nothing was discovered, Tahn LP met Jae Pao at the morning market. Jae Pao asked if Tahn LP found out the cause, she said if the Buddha image has bad things with it, she said she will offer it to Tahn LP. Ven. LP Jarun shook his head in displease and in his mind said to himself, these days, if bad things offer to temple, good things invite back home. Tahn LP asked for another 10 days as nothings has emerged. But Jae Pao said, no need to borrow anymore, I offer it to Tahn LP. Tahn LP Jarun declined saying I am not interested in the Buddha image but just asking for more time to get to the truth of the matter. Tahn LP then said to us, if the Buddha images that are genuine antique or a known inheritance from ancestors, if we always dedicate merits and metta to the thevadas that resides with the image, the truth will prevail. The following day Tahn LP Jarun received an invitation to deliver sermon MahaChart from a temple 20km away in Singhburi town. LP Jarun said apparently they claimed that these days very difficult to find a capable monk whom can preach MahaChart well and the sponsor particularly only wanted Tahn LP Jarun despite both doesnt even know each other. Tahn LP accepted the invitation to go, though it was only 20 kms away but those days no highway, travelling to the specific temple isn’t easy. However that day the driver decided to dropby the sponsor’s residence about 0.5km away from the temple. Tahn LP Jarun said no need as they don’t know each other, Tahn prefered to just carry out his responsibility and return to his temple. However the driver insisted and Tahn LP gave in. They received Tahn very well with pleasing manners and ethics. They were both elders in their 70s, the man said he was a monk for 15 years those days and while he was a monk then he was famous for preaching Mahachart all over the district. Tahn LP Jarun noticed that though they had a beautiful Buddha’s altar, there isn’t a single Buddha image on it. Tahn LP asked if they both will be glad if Tahn LP present them one. LP Jarun said temple has many, those Buddha buchas were blessed well in Wat PhikhunThong by Ven. LP Pae himself. The man surprisingly declined profusely and Tahn LP saw that the lady had tears rolled down her cheek. Then Tahn LP asked directly to the man, what happened to your Buddha image then. The man then explained, in his 15 years of servive as a monk preaching MahaChart. He received 3 Sukhotai Buddha images that were beautiful, he donated 2 to temples and kept one for himself after he disrobed. 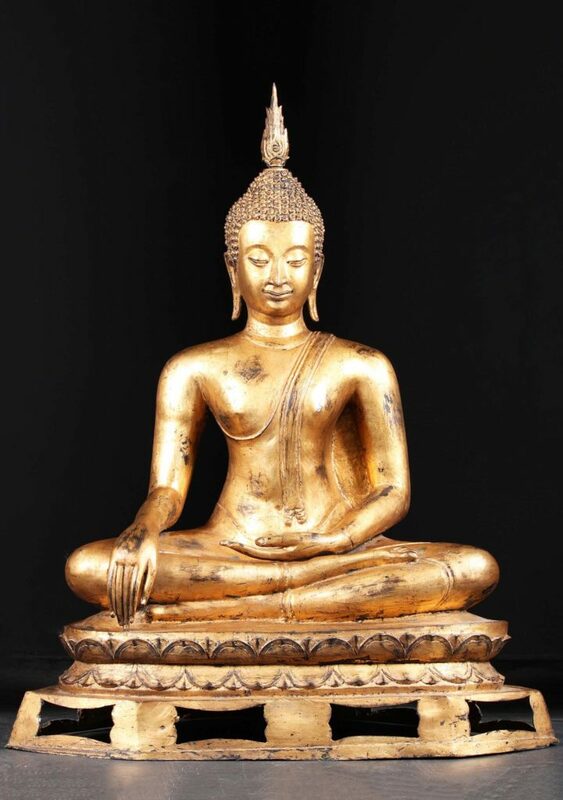 Things went very well for him and his family till this very day, he attributed his success, wealth and harmony to the Sukhotai Buddha image. But it was recently stolen, the man said there isn’t much valuables in his house. Even if there is much he isn’t heartbroken if it’s stolen. But they are both heartbroken when the thief stole the Buddha image too. The man said, since the day I invited back home to start a family life, me and my wife never fail to chant and meditate in front of the Sukhotai Buddha image. The man even mentioned that they dedicate metta and merits everytime after the task. The man even added, my bucha is very unique, it has a hole at the seat base of the Buddha image. However sad they were, they still practised to this very day, offerring rice, flowers and all, meditating and chantings, praying that the Sukhotai Buddha image will return to their home. They both project the mental image of Sukhotai Buddha as if it’s there whenever they do their offerings. 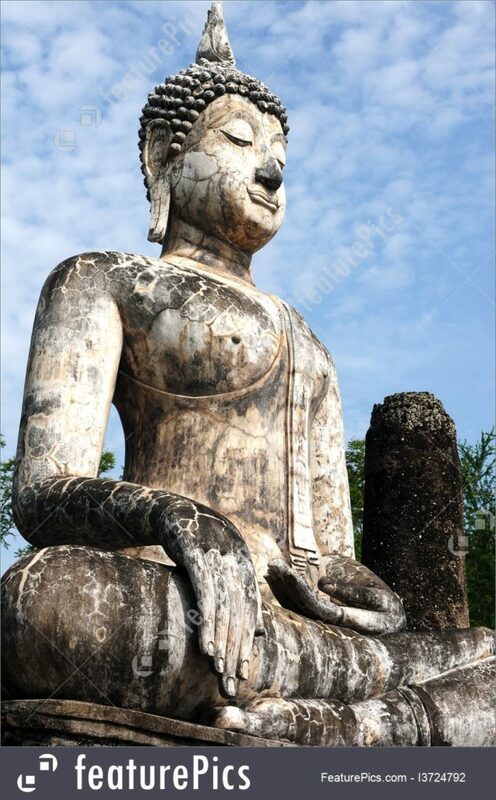 The man even said they never curse the thief but they hope the Buddha image will come back thats all. Though it was stolen 8 months ago and many friends and relatives have offered their beautiful collection to us, we declined them all. Even now Tahn Phra Khun Chao has offered us something very good but to us, it’s the only on we desire most. Somehow something struck Tahn LP’s mind that this invitation isn’t by chance as it was rather uncommon especially the prayers part at 5pm. Everything was too much a coincidence. Tahn LP Jarun asked about any unique marks on the Buddha image. The man said it has a hole at the base and he wrote the Khom letters NAK MO BUDH DHA YAK with a metal engraver on his own. Tahn LP Jarun immediately reqconized the same characteristics on the Sukhotai Buddha image of Jae Pao. Then Tahn LP said to us, please believe that whenever you sincerely chant, meditate and dedicate the metta and merits to your Buddha images, wherever you are they can receive it. Ven. LP Jarun was glad that Tahn himself is getting to the truth of the Sukhotai Buddha image. To make the long story short, Tahn LP trailed all the way to the robber to get to the truth. 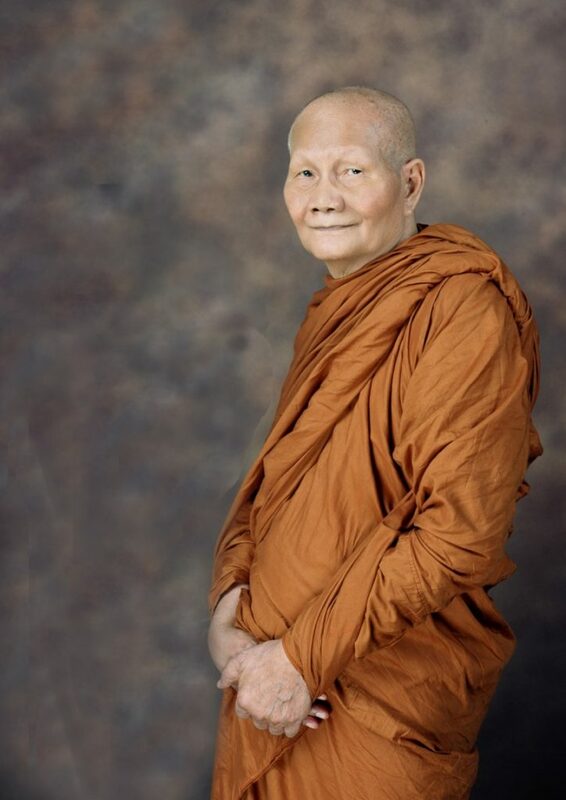 The conclusion was before Jae Pao rented the bucha, there were already 4 families suffered strange and bad occurences never happened before and they all blamed it on the Sukhotai bucha. Once traded hands, the bad occurences will be resolved by itself. Strangely all the families suffered the bad incidences 5pm sharp daily. After relating the entire findings to Jae Pao, the image was finally returned to their owner. Ven. LP Jarun said to us, it is fine if we do not believe but Tahn himself believes 1000% because Tahn himself sees to the end of it. I received questions as in they don’t understand why the curse happens. Well, our Buddhas are in Nibbannas, they are unattached to such, that is why Tahn LP Jaran said it couldn’t be the Buddha image. But Thevadas are still very much attached to defilements, though refine beings but they are not elightened yet. Therefore if everyday you have been offering yr utmost sincerities for decades but suddenly stopped. Unexplainable things may happen. be careful when dealing with sacred entities, are you up for it? Even if you are, are the people staying with you are aware? Eg. a bucha I personally had, when I took from my teacher, the ancient spirit of the Master (500 years old) possessed my teacher’s body and warned me, “you wished to invite me to be with you, I grant you your wish BUT if I find my image anywhere under a tree or in temples none other than my home of origin, you shall see that your descendants die one after another!” this was his words to me and vanished. Buddha saksit or Gaejik Archan saksit, wicha saksit, the person whom venerates them saksit. Only when such combination comes together you may witness such miracles. You are the part of the equation too. Are you playing your part?